Puggsy is what could be described as a physics-oriented puzzle platformer. That is to say, it’s a platforming game where you use items with a heavy emphasis on physics to solve puzzles and reach a goal. There are few other games that use these distinctions together, and even then they tend to be oriented around momentum more than anything, such as And Yet It Moves, NightSky and Mutant Blobs Attack. Puggsy himself is a brown, blobby looking alien with an antennae reminiscent of a hammerhead shark. The game opens with him making an emergency landing on an uncharted planet after having his ship shot at by a space pirate (who, according to the manual, was in a foul mood due to under-cooked eggs and burnt toast for breakfast). As Puggsy takes a look around, some natives that look suspiciously like large bipedal raccoons make off with his ship. And so Puggsy ventures forth in search of a way home. Controlling Puggsy is simple enough – one button to jump, one button to grab/drop objects and one to use a held object. When you’re holding an object, the up and down buttons on the directional pad move Puggy’s arms up and down, adjusting the height of your held object. Doing this allows you to create stacks of items that can be used to climb to new areas, or if you hold up and then the drop item button, you can throw the item with force. You can also get a bit tricky with this and use items to hook onto ledges and pull yourself up with momentum. Some secret areas actually require this skill. There are of course enemies that try and prevent you from progressing. There’s a few way to deal with them, such as throwing something at them, attacking them with an applicable object, such as a gun, or using the environment against them, for example letting a rolling steel ball crush them. Puggsy will lose a life upon being hit by an enemy or projectile. He’ll reappear in the same spot, but you only have five lives. Once those are gone you have to start from a couple of levels back, generally where the area began. A few items can mitigate risk, such as sunglasses which give you an extra hit-point before dying, or a shield which will protect you from any and all hits for a minute or so. The first few stages of the game serve as a good introduction to its mechanics and it slowly eases you into how things are going to go before you reach the first boss without ever feeling like its holding your hand too much. Early on you’re tasked with fairly simple puzzles. Move these barrels around to climb some rocks. Use a shell to push this switch. Find the missing part of the statue to reveal the exit. After that you’re whisked away to the first boss. While it starts off simple, the puzzles get trickier as you go on. For example, you might have to turn some fans on, then push some beach balls on top of the fans and then stand on those beach balls, now hovering in the air, to reach the exit of an area. Or combine a handful of items in a cauldron in order to make a potion that allows you to access a new area. The puzzles stay clever throughout the game and never really fall into the pitfalls of “how on earth was I supposed to figure that out”. Wearing cool shades can protect you from bears. The more you know! Boss battles in Puggsy are, appropriately enough, puzzles with an added sense of danger and tension. They’re also very technically impressive, showing off a lot of graphical trickery such as large sprites, rotation and scaling that the Mega Drive probably shouldn’t have been able to do very well or at all without expanded hardware, but somehow Traveller’s Tales pulled it off. Bosses are also one of the first things to differ between the versions of Puggsy. The original Mega Drive version of the game has six bosses, whereas the Mega CD release adds three more to the fray. 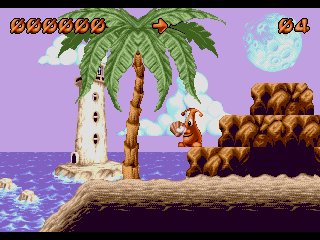 Aside from the first, or in the case of the Mega CD version first two, all the bosses are fairly clever and serve as excellent points for the game to switch up locales and interject “meanwhile” cutscenes where raccoons make off with Puggy’s ship some more. 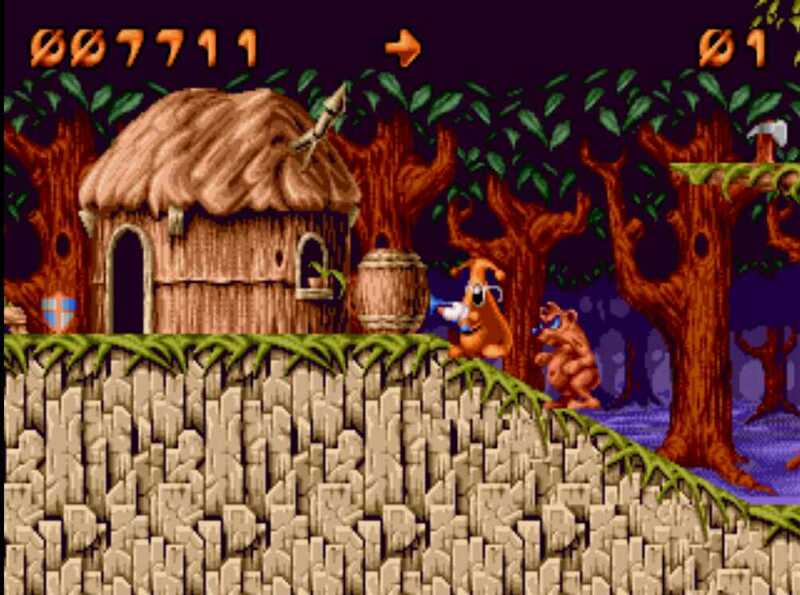 Puggsy is a fairly lengthy game for its sort, having forty-one levels to the end, alongside sixteen secret levels, giving plenty of playtime. There’s a password feature to ensure you don’t have to play the entire game in one sitting, but it’s a huge pain to use. Each password is twenty-seven numbers long, giving you fairly high odds of making a mistake when writing it down. The Mega CD version allows you to save to backup RAM, but also has the password system and specifically states in the manual that passwords will work between the Mega Drive and Mega CD versions. The Amiga version uses passwords too, but they are generated differently and will not work on the other versions of the game. Funnily enough, this password system ties into a cute anti-piracy measure on the Mega Drive version. While the cartridge itself lacks any save RAM, the game at a certain point tries to write to it anyway. If it’s able to, which it would be if you were using a copier that supported save RAM, it boots you out to an error screen that tells you to go out and buy it. The game’s development history is certainly an interesting tale, and very much out of the ordinary. 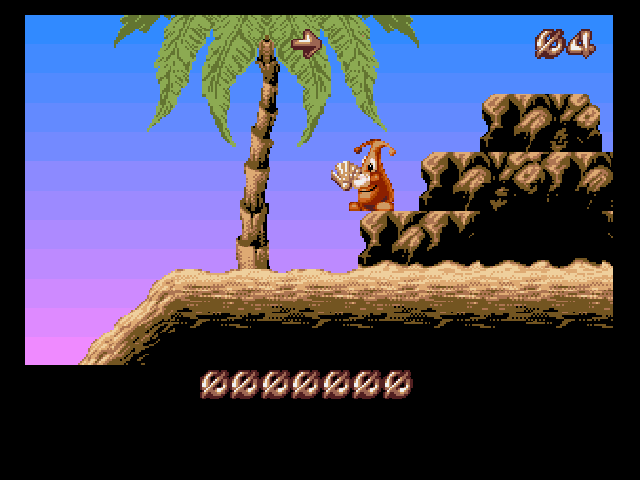 Puggsy started life as a “demo”, a non-interactive program used to show off what a group can do with graphics and sounds which were pretty popular in the Commodore 64 and especially Commodore Amiga days, for the Amiga by a group called “DIONYSUS“. DIONYSUS consisted of Alan McCarthy, Lee Carus (now an art director at Sony Computer Entertainment and brilliant photographer) and Tim Wright. The demo, called Puggs in Space, featured a somewhat downy-looking Puggsy wandering around the streets of a fairly Earth-looking planet, generally having bad things happen to him, such as a dog biting his arm off or having a helicopter crash land on him. Psygnosis ended up seeing this demo and liking the character. They bought the rights from DIONYSUS and put Traveller’s Tales at work on the Mega Drive version of the game. Once that was done, work began on the Mega CD version, again by Traveller’s Tales, and the Amiga port, which was made by a group called The Dome Software Developments, who basically existed to do Amiga ports for Psygnosis. The Mega CD port is the best version of the game. In addition to being able to save and having the extra boss fights, it features nice CD audio, composed by Matt Furniss, who also did the music for the Mega Drive game, a few graphical tweaks and some helpful “tutorial arrows” for the first couple of levels. It does however, replace the cutscenes with some awful quality full motion videos. While these might have been somewhat impressive in 1993, they look absolutely wretched now. Also added was the ability to jump on regular enemies to destroy them without the use of items, making the game a bit more fair. On the other hand, the Amiga version of the game should probably not be played at all. While it runs at a higher resolution than the original game did, the graphics look like they were badly upscaled to match, everything takes place in a box that takes up two thirds of the screen, the colours are awful and there are no backgrounds at all. The controls, due to Amiga joysticks only having one button, are cumbersome. You use up on the joystick to jump, the fire button to lift/drop, and then the keyboard to use and adjust height. If humans had three arms it probably wouldn’t be so bad, but it’s just awkward and makes playing the game a chore. Cutscenes are also changed to a still image, making them generally pointless. The music also suffers quite a bit. Though Tim Wright from DIONYSUS is credited, the songs seem to simply be bad rearrangements of the Mega Drive music that end up sounding very shrill. Interesting to note, Tim Wright ended up staying with Psygnosis for some time and went on to do the music direction for the Wipeout series of games, often lauded for their musical choices. Supposedly at one point there was going to be a Super Nintendo port of the game, but it seems no information was ever released about it. There was sadly never a follow up to the game, either. All in all, Puggsy is a very unique game, especially for its time and is definitely worth a look if you’re craving something different from the norm.